We will send you on your very own dream journey. A highly motivated team takes care of every detail – from consulting over booking to the entire coordination. A beautiful trip or day trip does not need to be expensive. This has always been the guiding principle of Bösche Reisen, running through all areas of our offers until today. With us, everybody will enjoy themselves. Whether you would like to go on a tour in an original team bus of the iconic St. Pauli football club or look for a seniors program specially tailored to your needs – each service is characterized by an excellent price-performance ratio, from the choice of destinations and hotels to the transfers. Travelling with us means receiving maximum performance, quality and service for your money. 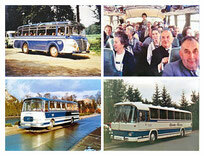 In 1958, the native Silesian Paul Bösche founded a bus company in Hamburg. Together with his wife Helene, he literally ran the company from his living room table in the early years. With its Büssing bus, he served the increasing number of commuting for workers from the new emerging urban districts and suburbs of eastern Hamburg and drove his customers to their workplaces in the booming port of Hamburg every day. Additionally, Paul Bösche’s company benefited from the poor local transport connections of the time and the first wave of German wanderlust. Italy in particular became a dream destination at the very top of the wish list of Hamburg’s people. Thus, the aspiring entrepreneur expanded his holiday travel offers not only by destinations in Germany, but also went to Austria and Italy. In 1965, a worldwide unique concentration of all major transport companies in Hamburg and the surrounding area emerged under the name “Hamburg Transport Association” (HVV). In the early 1970s, Paul Bösche took over more lines in eastern Hamburg, commissioned by the Hamburger Hochbahn. The fleet was supplemented by ten new Mercedes buses and thus significantly expanded. As part of the expansion, new company premises were built in Rahlstedt containing a modern vehicle hall and garage. In addition to the popular bus and train travels, affordable offers for holiday air travel were increasingly added. A newly founded travel agency expanded the Bösche family business and provided numerous regular customers with train, air or ferry tickets, as well as the popular package holidays from TUI and similar. Even with regard to their own travel offers, the number of destinations increased. Tours to France, Spain and Benelux countries or to Scandinavia could be booked at Bösche. From then on, guests reached their destinations in comfortable Mercedes buses with automatic doors, air-outlets and fabric-covered individual seats. From 1984 to 1987, the family expanded its premises by new vehicle halls and a new office building. With the opening of the inner German border, the demand for travel to the new federal states grew. The Baltic coast and the Mecklenburg Lake District as well as Thuringia and Saxony were practically only accessible by bus back then. On December 1st, 1991, the senior handed over the company to his two sons, travel agent Hartmut Bösche and automotive engineer Günter Bösche. The new management of the company focused increasingly on the holiday traffic and discontinued the HVV local traffic. The fleet consisted of modern Mercedes and Setra buses, equipped with air conditioning, toilet and galley. The trend towards second and third travel was met by Bösche with its range of urban and short trips. The company designed customized services in the field of wellness, activity and adventure travel also for the older generation, the so-called best agers. Since 2007, the football team of the iconic club FC St. Pauli is taken to all their games and trainings camps by Bösche Reisen. In 2011, Günter Bösche decided to merge with the Stambula group also based in Hamburg. The merger with the large operating transport company paved the way to new business areas and customers in the travel and day trip segment. Through a joint fleet and pooling their marketing activities both companies could preserve their competence and increase their market share. The course for a positive business development in the future is thus set. Maximilian Stambula controls the fate of the company as the new department head. The successful concept of Bösche Reisen was maintained. Then and now, the company offers its customers tailor-made trips with an excellent experience factor at an unbeatable price-performance ratio.